Starbucks, Hear Music and Lava Records will jointly launch the emerging Lava band, Antigone Rising, via a new Starbucks Hear Music proprietary CD series entitled "Hear Music Debut" and a unique Starbucks marketing campaign. Antigone Rising's first album, From The Ground Up, will be sold exclusively in the more than 4,400 Starbucks Company-operated stores in the United States and on www.starbucks.com and www.hearmusic.com beginning May 11. Antigone Rising was selected as the inaugural band featured in Starbucks Hear Music's new "Hear Music Debut" CD series created specifically to introduce new and developing artists. The album, From The Ground Up, is a live, acoustic performance, which was recorded exclusively for Starbucks customers at the Sony Studios in New York City. "With Ray Charles, Bebe Winans and Tina Turner among others, we have demonstrated that we can effectively leverage our unique marketing and distribution assets as well as our customer base to support established artists," said Ken Lombard, president of Starbucks Entertainment. "Today's announcement marks another step in our overall music strategy, and enables us to uniquely parlay our marketing and distribution strength to break new artists. It also demonstrates the varied ways we are working with innovative labels and partners, such as Lava, to positively influence the music industry." 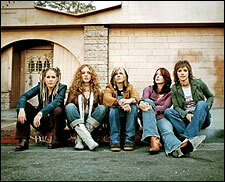 Antigone Rising, the all-female quintet hailing from the New York/Tri-State area, has toured in 43 of the 50 states and has opened for Aerosmith and former Black Crowes' Rich Robinson during the summer of 2004. "We are excited about our partnership with Starbucks as well as being the first band selected for the 'Hear Music Debut' series," said Antigone Rising lead singer, Cassidy. "Now more than ever it's important to have strong alliances, and creative marketing, in order to get your music heard. We believe that with the amazing team at Starbucks Hear Music, in addition to the great people at Lava, we have a once-in-a-lifetime opportunity to expose new people to Antigone Rising."